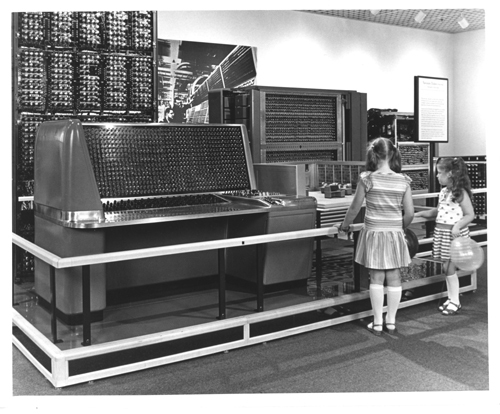 B&W image of two small girls looking at the console of the IBM SSEC exhibit. From Vacuum tubes to integrated circuits: With more than 12,000 vacuum tubes and 21,000 electromechanical relays, the IBM SELECTIVE SEQUENCE ELECTRONIC CALCULATOR (SSEC) of 1947 was the first computer to combine electronic computation with stored instructions. Pictured here is the SSEC console, one of more than 300 machines and device on display in the IBM Gallery of Science and Art, 590 Madison Avenue, New York. It's part of the gallery's inaugural exhibition entitled "Innovation in IBM Computer technology ranging from punched cards and vacuum tubes to today's integrated circuits with speeds measured in billionths of a second. The exhibition is free and open to the public through November 19,1983. ###"